I will admit that my husband and I are not what you would call camping fanatics. We camp because our children love it. We camp because it is inexpensive. We camp because it is quality time together. We camp because we were able to pay cash for an air conditioned tent trailer with two king sized beds and a pop out dinette. Yeah, we don’t rough it at all. Our lack of roughing it skills aside we do camp at least 2 or 3 times a season for 3 to as many as 5 nights at a time. We also camp with 3 children and a dog. 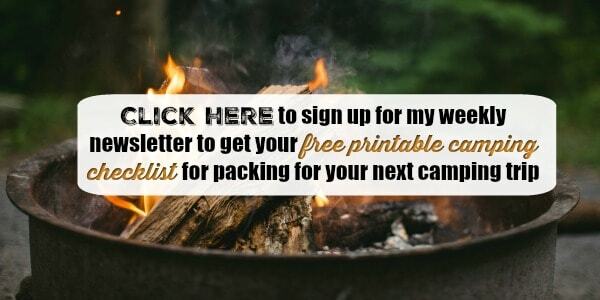 I have a master list that lists all the things that we need each and every time we camp. Things like the sheets for all the beds, pillows, campfire supplies etc. I also make up a menu and a grocery list each and every trip and double check that I have all ingredients before I leave. If we are camping far away I do my grocery shopping when we arrive, as my family sets up camp. I have access to a microwave and a large toaster oven, and I can bring my crockpot along if I need too. Still I prefer to keep meals simple so that I have more time to hang out with the children. Our dinner might be pork chops and a salad, or mac and cheese and hot dogs. Lunch is sandwiches and breakfast is instant oatmeal or cold cereal. The first time we went camping I was alarmed at how fast my children went through our snack supply. Being outdoors creates the perfect environment for more physical activity. My kids are out biking, swimming, hiking, playing at the park and generally running around everywhere. Basically they become calorie burning machines, so I quickly learned to bring double the snacks that we normally require at home. I often bake up big batches of muffins and cookies, and pack along precut cheese and crackers. I buy a huge bag of baby carrots and lots of fresh fruit. If it rains you want something to do. I always make sure we have at least 2 or 3 family games along. If you are short on space a deck of cards and a few printed off instructions for card games will work. Boredom strikes even at campgrounds, or two brothers end up playing boy games leaving a sister out. In these situations I try and have a stash of new sidewalk chalk. Or a new shovel and pail, or perhaps an inexpensive squirt gun to start a water fight with those brothers. When my children were little whenever we went places they might get separated from us we made sure they had a card with all our contact numbers on it and explained to them who to seek out for help. When we go camping I take the children for a tour of the campground once we arrive and point out the camp host spots telling them to seek them out if they need help. Now that they are older I make sure they have a cell phone in their pocket before they take off biking, and have them tell me where they are headed and how long they expect to be gone. Beside what to do if you get lost you also need to go over the safety rules for open fires, approaching wildlife, how deep is deep enough when open water swimming, and any other set of rules that makes sense in the area you are camping in (pointing out poison ivy so as to avoid it is another great preventative talk). When we are at home we tend to eat a fairly clean diet. When we are camping our clean diet is a little less clean and I am okay with that. I also relax the rules for bedtime, and whatever other rules I can to make the experience fun and relaxing yet safe for the children. When camping with children I try to remember that this is time to make memories with them. This is not time for me to relax (although now that they are older I do generally get to relax some, often reading one or two books per trip). Especially when they were younger I would mentally be prepared to spend the weekend serving my children often making sure I had a me time event planned before we went and some more me time planned for when we returned. Planning this me time before and after helped me to be able to be in the moment and enjoy the precious gift of 3 lives God has given me. I would also try to get out of the tent trailer (or when they were little tent) before they awoke to have a few moments alone before the mommy requests started. 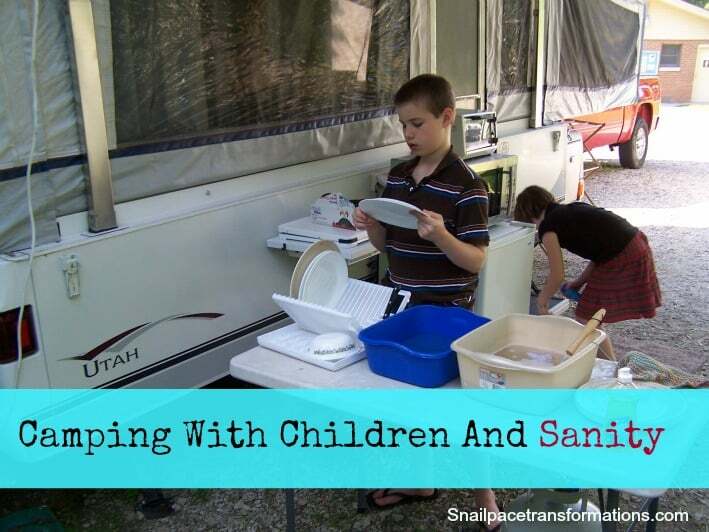 Do you camp with children? What are your tips to share?